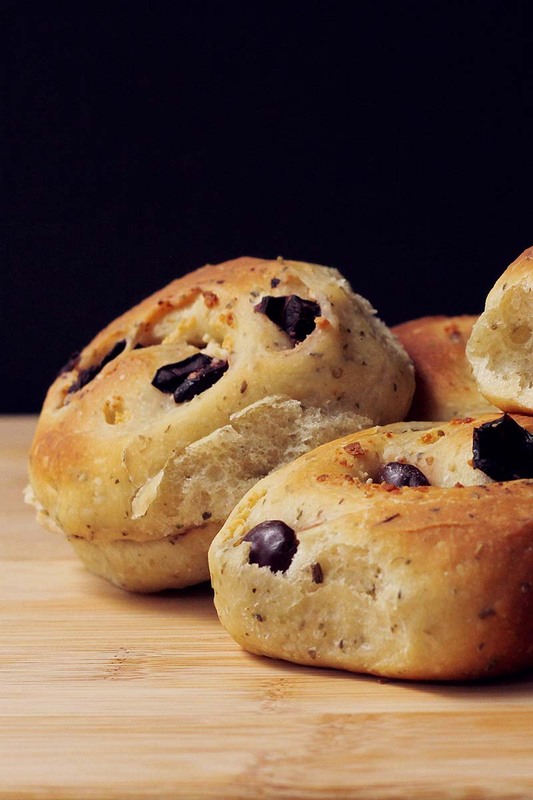 These rolls are filled with olives & feta cheese, and the dough is flavored with oregano. They're tasty all by themselves, but also perfect with dinner, particularly when you're serving something with Greek or Mediterranean flavors. Combine the water, bread flour, sugar, yeast, salt, olive oil, mashed potato flakes and oregano in the bowl of your stand mixer fitted with the dough hook. If you prefer, you can mix the ingredients in a bowl and knead by hand. Knead until the dough is elastic. Cover the bowl and set aside in a warm place until the dough has doubled in size, about an hour. Flour your work surface and spray a 9 x 13-inch baking pan with baking spray. Roll the dough to a rectangle about 9x13 inches. It doesn't need to be precise. You can just eyeball it to see that it's about the same size as your pan. With one of the long sides of the dough facing you, sprinkle the cheese and the olives over the surface of the dough, leaving about 1 inch uncovered on the far end. Use the rolling pin to gently press the filling into the dough. Starting with the end closest to you, gently roll the dough, jellyroll-style. Don't roll super-tight. When you reach the opposite end, pinch the seam to seal the roll. Cut the dough into 12 even pieces and place them, with the cut side up, in the prepared pan. When you're ready to bake, take the pan out of the refrigerator and let sit at room temperature for about an hour. Preheat oven to 350°F. When the oven has heated, remove the cover from the pan and bake the buns until they're nicely browned and cooked through - about 50 minutes. Remove the buns from the pan (you can flip them out onto a rack, then flip them over onto another rack so they're right-side-up) and let them cool before serving.